"University pauses..." 4 (of 4) DI Oct. 16, 1969 Ed Hoffmans, former draft counselor and University of Northern Iowa instructor, who received occasional boos for saying he thought it would be the National Liberation Front (NFL) and not the antiwar movement that would get American troops our of Vietnam. He said the purpose of the antiwar movement was to stop the nation's business, stop the draft and its messing up of young men's lives, and stop the "social control which our educational system practices." 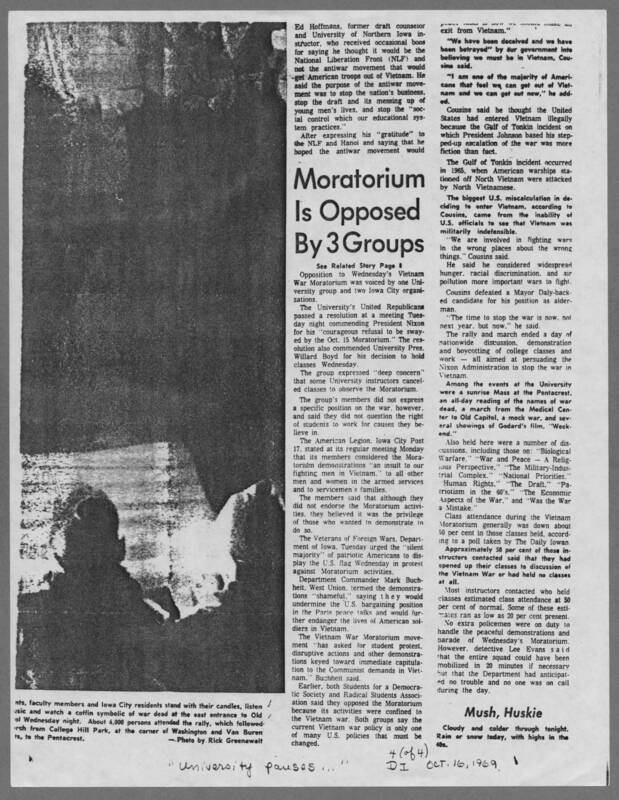 After expressing his "gratitude" to the NFL and Hanoi and saying that he hoped the antiwar movement would Moratorium Is Opposed By 3 Groups See Related Story Page 8 Opposition to Wednesday's Vietnam War Moratorium was voiced by one University group and two Iowa City organizations. The University's United Republicans passed a resolution at a meeting Tuesday night commending President Nixon for his "courageous refusal to be swayed by the Oct. 15 Moratorium." The resolution also commended University Pres. Willard Boyd for his decision to hold classes Wednesday. The group expressed "deep concern" that some University instructors canceled classes to observe the Moratorium. The group's members did not express a specific position on the war, however, and said they did not question the right of students to work for causes they believe in, The American Legion, Iowa City Post 17, stated at its regular meeting Monday that its members considered the Moratorium demonstrations "an insult to our fighting men in Vietnam," to all other men and women in the armed services and to servicemen's families. The members said that although they did not endorse the Moratorium activities, they believed it was the privilege of those who wanted to demonstrate in do so. The Veterans of Foreign Wars, Department of Iowa, Tuesday urged the "silent majority" of patriotic Americans to display the U.S. flag Wednesday in protest against Moratorium activities. Department Commander Mark Buchheit, West Union, termed the demonstrations "shameful," saying they would undermine the U>S> bargaining position on the Paris peace talks and would further endanger the lives of American soldiers in Vietnam. The Vietnam War Moratorium movement "has asked for student protest, disruptive actions and other demonstrations keyed toward immediate capitulation to the Communist demands in Vietnam," Buchheit said. Earlier, both Students for a Democratic Society and Radical Students Association said they opposed the Moratorium because its activities were confined to the Vietnam war. Both groups say the current Vietnam war policy is only one of many U>S> policies that must be changed. [intelligible] exit from Vietnam." "We have been deceived and we have been betrayed" by our government into believing we must be in Vietnam, Cousins said. "I am one of the majority of Americans that feel we can get out of Vietnam and we can get out now," he added. Cousins said he thought the United States had entered Vietnam illegally because the Gulf of Tonkin incident on which President Johnson based his stepped-up escalation of the war was more fiction that fact. The Gulf of Tonkin incident occurred in 1965, when American warships stationed off North Vietnam were attacked by North Vietnamese. The biggest U.S. miscalculation in deciding to enter Vietnam, according to Cousins, came from the inability of U.S. officials to see that Vietnam was militarily indefensible. "We are involved in fighting wards in the wrong places about the wrong things," Cousins said. He said he considered widespread hunger, racial discrimination, and air pollution more important wards to fight. Cousins defeated a Mayor Daly-backed candidate for his position as alderman. "The time to stop the war is now, not next year, but now," he said. The rally and march ended a day of nationwide discussion, demonstration and boycotting of college classes and work -- all aimed at persuading the Nixon Administration to stop the war in Vietnam. Among the events at the University were a sunruse Mass at the Pentacrest, an all-day reading of names of war dead, a march from the Medical Center to Old Capitol, a mock war, and several showings of Godard's film, "Weekend." Also held here were a number of discussions, including those on: "Biological Warfare," "War and Peace -- A Religious Perspective," "The Military-Industrial Complex," "National Priorities," "Human Right," "The Draft," "Patriotism in the 60's" "The Economic Aspects of the War," and "Was the War a Mistake." Class attendance during the Vietnam Moratorium generally was down about 50 per cent in those classes held, according to a poll taking b the Daily Iowan. Approximately 50 per cent of those instructors contacted said that they had opened up their classes to discussion of the Vietnam War or had held no classes at all. Most instructors contacted who held classes estimated class attendance at 50 per cent of normal Some of these estimates ran as low as 20 per cent present. No extra policemen were on duty to handle the peaceful demonstrations and parade of Wednesday's Moratorium. However, detective Lee Evans said that the entire squad could have been mobilized in 20 minutes if necessary but that the Department had anticipated no trouble and no one was on call during the day. Mush, Huskie Cloudy and colder through tonight. Rain or snow today, with highs in the 40s.